The plazas de soberanía, plus Ceuta, Melilla, and Alborán Island. 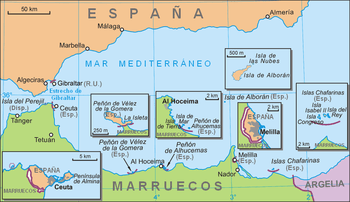 The plazas de soberanía (Spanish pronunciation: [ˈplaθaz ðe soβeɾaˈni.a], literally "places of sovereignty") are the Spanish sovereign territories in North Africa. These are separate pieces of land scattered along the Mediterranean coast bordering Morocco. 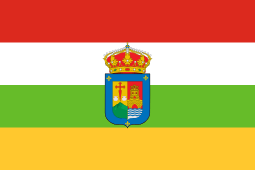 The name refers to the fact that these territories have been a part of Spain since the formation of the modern Spanish State (1492–1556), and are distinguished from African territories obtained by Spain during the 19th and 20th century. 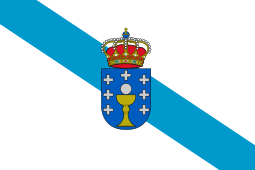 Historically, a distinction was made between the so-called "major sovereign territories", comprising the cities of Ceuta and Melilla, and the "minor sovereign territories", referring to a number of smaller enclaves and islands along the coast. In the present, the term refers mainly to the latter. In 1415 the Portuguese conquered Ceuta. In 1481 the Papal bull Æterni regis had granted all land south of the Canary Islands to Portugal. 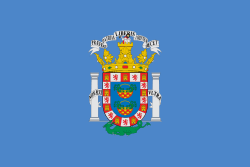 Only this archipelago and the possessions of Santa Cruz de la Mar Pequeña (1476–1524), Melilla (conquered by Pedro de Estopiñán in 1497), Villa Cisneros (founded in 1502 in current Western Sahara), Mazalquivir (1505), Peñón de Vélez de la Gomera (1508), Oran (1509–1790), Algiers (1510–1529), Bugia (1510–1554), Tripoli (1511–1551), and Tunis (1535–1569) remained as Spanish territory in Africa. 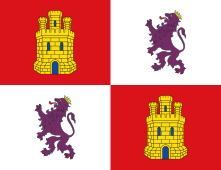 Finally, following the independence of Portugal from Spain, Ceuta was ceded by Portugal to Spain in 1668. In 1848, Spanish troops conquered the Islas Chafarinas. 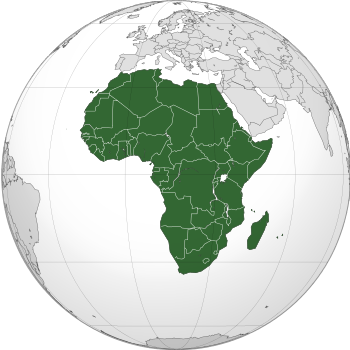 In the late 19th century, after the so-called Scramble for Africa, European nations had taken over colonial control of most of the African continent. The Treaty of Fez (signed on March 30, 1912) made most of Morocco a protectorate of France, while Spain assumed the role of protecting power over the northern part, Spanish Morocco. 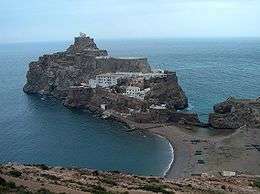 On July 11, 2002, Morocco stationed six gendarmes on Perejil Island, which was at the time a source of complaint by Spain. The Spanish Armed Forces responded by launching a military operation code-named Operation Romeo-Sierra. The attack was carried out by Spanish commandos of Grupo de Operaciones Especiales. 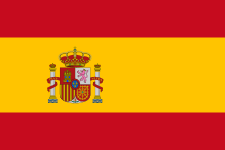 The Spanish Navy and Spanish Air Force provided support; the six Moroccan navy cadets did not offer any resistance and were captured and evicted from the island. It has since been evacuated by both countries. Just like Ceuta and Melilla, they are a part of Spain, therefore also part of the European Union, and their currency is the euro. 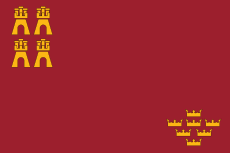 Morocco claims sovereignty over the Spanish North African territories, plus the autonomous cities of Ceuta and Melilla. ↑ da Silva, Rui A. M. "Treaties Galore". Olivença - Portugal Livre. ↑ "Treaty Between France and Spain Regarding Morocco". The American Journal of International Law. 7 (2): 81–99. April 1913. doi:10.2307/2212275. JSTOR 2212275. ↑ Ceberia Belaza, Monica; Ignacio Cembrero and Miguel González (17 September 2012). "The last remains of the empire". El Pais in English. Madrid. Retrieved 24 September 2012.